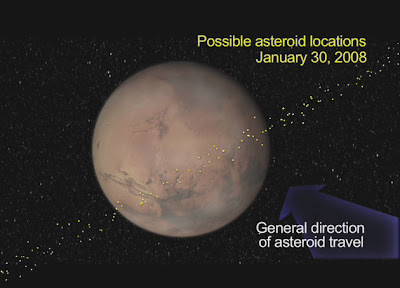 Visual Astronomy: Asteroid to Impact Mars? Astronomers at NASA's Near Earth Object program are keeping close watch on asteroid 2007 WD5. This asteroid is estimated to be 50 meters wide, and will cross Mars' orbit early in 2008. Archival imagery has recently allowed astronomers to more accurately describe its trajectory, which until recently was largely uncertain. Current models predict a 1 in 25 chance that asteroid 2007 WD5 will impact Mars on January 30th, 2008, at a speed of about 27,900 miles per hour. Depiction of Asteroid 2007 WD5's possible path. In this image, each of the yellow dots represents a possible location for Asteroid 2007 WD5 on January 30th, 2008. Note that some of the dots are on Mars' surface. This belt of possible impact regions lies just north of where the Mars rover Opportunity is currently exploring Victoria Crater. If this asteroid were to impact Mars, it would leave a crater larger than a half-mile wide, about the size of Victoria Crater. In such an event, we could possibly see footage of the impact from the Mars rovers, and from ground and space-based telescopes. This may be the next Shoemaker-Levy 9, or it could be a dud. Only time will tell. I like your blog too! You did a nice job distinguishing it from all the other Blogger blogs out there! NASA-JPL has refined their estimate of the odds of impact. The odds now stand at a 1 in 28 chance of impact, or 3.6%. Pretty slim, but maybe we'll get lucky! An individual has a substantial proficiency just for making completely unique content and articles. I recommend the way think that and additionally fascination with this occupation legally represent any displays we are going to. Document realizes any attitude. At this time follow here check cashing With thanks just for stating. PC Malware est considéré comme l'un des mauvais programmes qui peuvent s'infiltrer dans votre ordinateur très mal. Il peut attaquer différentes versions de systèmes Windows et attaquer vos programmes de navigation légitimes sans aucune approbation. Cette menace utilise plusieurs astuces trompeuses pour s'infiltrer dans votre ordinateur, comme l'accès aux spams, aux messages infectés, aux réseaux de partage de fichiers peer to peer et au téléchargement d'installeurs shareware à partir de sources non sécurisées. Une fois activé, il modifie les paramètres par défaut de vos navigateurs Internet tels que la page d'accueil, la page du moteur de recherche et ainsi de suite. Donc, il est très nécessaire de le retirer de votre PC Windows en permanence.